She entered service in June of 2000 and splits her time between Europe and the Caribbean sailing out of Amsterdam, Genoa and Ft. Lauderdale. Her exterior is a bit odd - with a very boxy profile and unique paint job. Her claim to fame is The Olympic Restaurant which includes paneling that was originally on board Titanic's sister ship Olympic. Accommodations and service on board are generally very good although not necessarily as good as Celebrity's marketing campaign would lead you to believe - come on is there really such thing as a "six star" ship? Note: The ship had a number of mechanical problems during her initial cruises and has been in dry dock once to correct a vibration problem with her propulsion systems. This has resulted in a number of cruises being cancelled. Almost all of Millennium's public areas are located on four decks - Sunrise, Resort, Entertainment and Promenade. As with many of the ships that have entered service over the past few years Millennium public spaces are comfortable and consistent. Unfortunately, with the exception of The Olympic restaurant most of the other public area could just as easily be part of a large hotel resort on land. Our review of the Millennium's public areas begins on the Deck 11, the Sports Deck where you will find the basketball court, volleyball, table tennis, compact football court and a number of small observation areas which provide great sea views. One deck down, is Deck 10 the Sunrise Deck which features a jogging track, and the Ship Mates Fun Factory youth area and video arcades located aft. Moving forward you find the Golf Simulator and the Extreme sports bar with an "extreme sports" theme and large screen TVs. Artwork in the bar includes the following painted fiber glass figures participating in active sports: "Climber," "Fly & Dive," "Snowboarder," etc. and in the stairwell is the "Summer Green" chandelier by Dale Chihuly. Continuing forward you can look down at the Riviera pool below or stop by the Mast Bar for a cool drink. Forward on the Sunrise deck is the Cosmos observation lounge with Panoramic views over the ship's bow. This is a nice place to meet for drinks before dinner or dance the night away later in the evening. As for bars and drinks, Celebrity has some the highest drink prices afloat so don't be surprised if the bar tab slipped under your cabin door on the last night of the cruise ends up being more than you may have experienced on other premium cruise ships. A 15% gratuity is automatically added to bar tabs. Walking down the stairs outside of Cosmos leads you to Deck 9, the Resort Deck. The forward portion of this deck features The Aqua Spa where you will find a well equipped gym with treadmills and weight machines. Those looking for something a bit more sedate can take advantage of the spa's Thalassotherapy sea water baths, medicinal muds or herbal steam bath. There is a small area for drinks at the back of the Spa. Moving aft, you go outside and reach the Riviera Pool, the main pool area of the ship. A grill serves burgers and other casual food during the day and live music is features most days on a small bandstand. There is also a bar and several whirlpools. 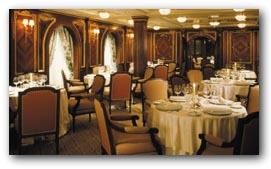 Continuing aft you reach the Ocean Caf�/Ocean Grill, which is the ship's main casual dining area. A typical lunch buffet includes a pasta bar, freshly made pizza, grilled steak, hamburgers and much more. The next four decks - Sky, Panorama, Vista and Penthouse - consist almost entirely of passengers' accommodations. Two glass enclosed elevator shafts run up the port side of the ship from deck 2 to deck 10. The ship's two-story library, Words is located across from the elevators on the Sky and Panorama decks. The library offers passengers a wide range of English-language books on the Panorama Deck and other language books on the Sky deck. There is also a card room, which is the perfect place to meet friends for board games or bridge. Notes, which Celebrity claims is the first music library at sea, is located in a similar space across from the elevators on the Vista and Penthouse decks. Here passengers can enjoy a personal listening station where they can access thousands of digital musical recordings. Moving down to Deck 4, the Entertainment Deck, you will find the top balcony of the three-story Celebrity Theatre occupying the forward part of the deck. As you exit the theatre you enter the Emporium shopping arcade with the typical selection of overpriced shipboard clothing, collectables and personal accessories. Just past the Emporium is Cova Caf� Milano which is affiliated with the historic Milan-based coffeehouse Pasticceria Confetteria Cova. The Cafe features coffee, cappuccino, tea which can be combined with a wide variety of liqueurs, chocolates or fresh pastries and occupies the forward part of the upper level of the three-story Grand Foyer. In addition to tables around the atrium there is a separate tea room. Continuing aft, you reach the Platinum Club lounge which hosts Celebrity's martini bar and champagne bar and and impressive display of caviar - all available at an additional charge. The upper level of the two-story Metropolitan restaurant occupies the remainder of the Entertainment Deck. Curved double staircases in the Metropolitan restaurant lead down to Deck 4 - the Promenade Deck - and the main level of the Metropolitan restaurant. Moving forward from the restaurant you will find the Rendez-Vous Lounge, which offers guests quiet niches and plush, comfortable seating. The balcony of the Platinum Club, one level above, overlooks the Rendez-Vous dance floor stage. As you exit the Rendez-Vous Lounge, you pass through the second level of the Grand Foyer before reaching Fortunes Casino, which offers a typical shipboard selection of slot machines, blackjack tables, and roulette. As you exit the Casino, on the port side you will find Michael's Club another quiet lounge that also serves as the meeting place for those in search of a good cigar and after-dinner drink liqueur. The second level of the Celebrity Theatre occupies the forward portion of this deck and the next deck, the Plaza Deck. Partial promenades extend the length of either side of this deck. Continuing our tour, as you descend to the Plaza deck and exit the main level of the Celebrity Theatre, you will pass through passenger accommodations before reaching the main level of the Grand Foyer with it's onyx staircase and marble floors. The Guest Relations and Shore Excursions desks are adjacent to the Grand Foyer. Just past the Grand Foyer on the port side is The Olympic specialty restaurant which includes wall paneling salvaged from Titanic's sister ship Olympic and decor based on the original Olympic/Titanic first class dining room interiors. Across from The Olympic restaurant is the Cinema and Conference Center, which serves the dual role of movie theatre for passengers and location for on board business meetings. The Conference Center includes all of the necessary capabilities include multi-lingual translation using a wireless transmitter and headsets, interactive audience key pads and multi-media audio/visual systems. Just a couple of years ago, a big sales point for taking a Celebrity cruise was the food. With menus inspired by chef Michel Roux, and top notch galley crew to prepare it, it was almost a given that you would leave the ship's dining room with a smile. Recently though we continue to receive reports that the quality has slipped.....this has become a bit of an epidemic in the cruise industry.....as fleet sizes increase, and fares decrease, something's gotta give....and the easiest thing to cut is the food. We are not saying the food isn't good anymore....it's fine....but it's on average, not much better than rival companies' offerings.....so you'll be well fed, but probably not wowed. Another problem - although not limited to Celebrity - is the approach in the dining room where the waiter can only turn in all of the tables orders at once. If someone is late to your table, the rest of the table suffers and some nights this results in a very drawn out and uncomfortable dinner experience. The Millennium's Metropolitan Restaurant is decorated with dark paneling throughout and is spacious, however, many tables on the lower level are too close together, making it difficult for the waiters to pass between the tables without brushing against the guests. Perfectly serviceable, if not memorable, buffets for breakfast, lunch and midnight are available in the Ocean Caf�/Ocean Grill. Most of the seating for this restaurant is inside. What tables there are on the aft deck behind the Cafe are on the open deck, exposed to the wind & weather. As we mentioned earlier, the alternative dining restaurant on board the Millennium is The Olympic restaurant. The designers of this restaurant recovered wood paneling from the original ship and used it in the design of the restaurant. Unfortunately, they only had enough of this beautiful walnut paneling to cover the walls of the smaller of the two rooms comprising the restaurant. The larger room is decorated with pretty, but nondescript white wall covering. The menu used here is quite similar to those in HAL�s Marco Polo restaurants. The difference being the price. Whereas HAL charges no additional fee in their alternative restaurants, Celebrity is charging a whopping $25.00 per person!! What is offered for this price is essentially a three-course meal. You are given a choice of an appetizer, or soup, or salad plus an entree & dessert. When looking at the menu before making reservations it is quite misleading, giving the impression the meal includes appetizer & soup & salad, plus entree & dessert. Sadly this is not the case. The food is good, but not exceptional. A late night buffet is typically served four nights on a seven-night cruise. The other nights snacks are passed in the lounges that are still open at midnight. Other than the late night buffets there are usually no deck buffet luncheons or barbecue dinners. Cabins on the Millennium are roomy and well planned and appointed - a significant step up from the older Celebrity vessels. At a generous 171 square feet for inside cabins, and 172 square feet for outsides, standard grades have two lower beds that in most cases, are convertible to a king, sufficient drawer and wardrobe space, a pleasantly arranged bathroom with shower, a mini bar, hairdryer, safe and television. The suites on board are large and expensive. They are located across the hall from the glass elevators and have curved panoramic windows only. At 537 square feet of inside living space, with 94 feet to call your "yard", the Suites have a bedroom, a regular living room and dining area, a dressing room with walk in closet, and a whirlpool tub and stall shower. For most people the Family/Large Ocean View cabins are a better deal. At 271 square feet they include all of the amenities you need including a spacious sitting room, entertainment center and interactive TV and VCR and verandah. Next step down is the Premium Ocean View cabin which is 191 square feet and has a tiny veranda. If you don't need a verandah the 171 square foot Oceanview or Inside cabins should be more than serviceable. All of the rooms on board come with a mini bar and refrigerator plus two terry cloth robes. There is no fruit or flowers in the rooms. This ship also has interactive television in the rooms. By using the remote control a guest can order room service, order shore excursions, view their on board statement, or order �pay for view� movies. Although there are free older movies shown continuously on different channels the �pay for view� movies are not that new and at $8.99 per movie it clearly is a rip off. Celebrity has engaged a new production company, Molyneux Musick International, to produce their musical revues on their new Millennium type ships. On a typical 7-day cruise three production numbers will be presented. Each of these shows has a large company of 17 performers, 12 dancers & 5 singers. A recent cruise included the following shows: �Classique, a Musical Odyssey� featuring as you might expect, classical music, �Pure Platinum� featuring rock & roll remembrance of the 60�s - 70�s era and � Spectacle of Broadway� featuring songs from well known Broadway shows. In addition to shows, musicians entertain in several of the lounges during the evening and most of the time they are excellent. Millennium splits her time between Europe and the Caribbean. In Europe she generally sails from Barcelona (Spain) on 12-day Eastern European itineraries. Stops include Villefranche (France), Livorno(Florence/Pisa), Civitavecchia (Rome), Naples (Italy), Mykonos (Greece), Santorini (Greece), Piraeus (Athens), Dubrovnik (Croatia), Venice (Italy) plus two days at sea. Eastern Caribbean itineraries depart from Ft. Lauderdale and include stops at Casa De Campo (Dominican Rep), San Juan (Puerto Rico), Charlotte Amalie (St. Thomas) and Nassau (Bahamas) plus two days at sea. Although Celebrity's advertising caters to those in the 30's and 40's age group, you'll find all types on board. The cabins are large enough to provide comfort to families.....so on holiday and summer trips, keep that in mind. The line's fixation with all things up to date......electronic gewgaws, pay per view movies in the cabins....to name a few, are to reel in the more affluent, on-the-go type of vacationer. Over the past several years the quality of the food, and level of service on board the Celebrity fleet has been inconsistent. 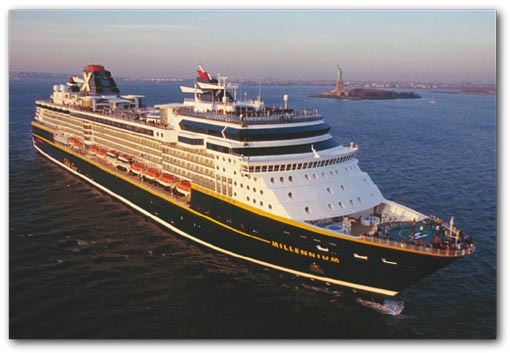 While this is not necessarily unique to Celebrity, throughout this period the company continued to promote itself as the "highest-rated premium cruise line in the industry" and a company whose vessels are "consistently recognized with five- and six-star rankings". Unfortunately, the reality is that the company could not be what they claimed to be because the fares they collected did not permit them to operate the type of product they aspired to be. Recently though, Celebrity has implemented a series of initiatives designed to improve all aspects of shipboard service. These initiatives grew from a the results of a quality assessment program that was conducted fleetwide. While these initiative has helped improve the onboard experience, keep in mind that not all of these initiatives are available on some of the older vessels in the fleet. So do these changes mean that you will now have a great great cruise if you take the Millenium? Probably yes. But will your cruise be extra special, giving you something other lines cannot? That depends on your expectations. If you are looking for a step up from Carnival or Royal Caribbean you most likely will be plesantly suprised with your Celebrity experience. If however you are really looking for the five and six star product promoted in Celebrity advertising, you may have a hard time finding it on on board.